This is a sponsored conversation written by me on behalf of Neutrogena® and #WeAllGrow Latina Network. The opinions and text are all mine. Hey guys! Hope you all had an amazing last official weekend of summer before Fall begins! It's Beauty Monday today on the blog and I'm sharing my skin care concerns with you guys. I'm also sharing how I am keeping my skin healthy. As much as I love makeup, taking care of my skin is unequivocally more important. I've always said that behind a good makeup look there's an even better skincare routine. For me I like to keep a consistent skincare regimen because then it becomes easier to see results. I'm excited to join the #PielSanaEsBella campaign with Neutrogena because cuando mi piel esta sana yo me siento mas confidente (when my skin is healthy I feel more confident). Neutrogena is the #1 dermatologist recommended brand that I've trusted and relied on for many many years. When it comes to my skincare concerns, wrinkles are on the top of the list believe it or not. Eeek! I have terrible wrinkles on my forehead and I have tried covering them up with concealer more often than not but as I got older I knew I had to address the issue at the root and not just cover them up. I'll be turning 31 in a couple of months so I'm making sure I'm keeping my skin healthy so that the 60 year old grandmother in my future will thank the 30 year old wife in my present for taking care of my skin. I decided to put Neutrogena's Rapid Wrinkle Repair Moisturizer Broad Spectrum to the test, since it is formulated with retinol to renew the look of the skin throughout the day and visibly fade stubborn deep wrinkles. The formula is combined with UVA/UVB SPF 30 for daily sun protection, which is incredibly important for the skin. I paired this product with Neutrogena's Hydro Boost Gel Cream Extra-Dry skin to boost and lock hydration to my skin. The gel is oil free and so smooth to touch. The unique gel formula absorbs quickly like a gel but has the intense moisturizing power of a cream to that helps lock in hydration. These two products work amazingly together. After using them for a week my skin felt fresh, rejuvenated and the best part? I am starting to see those annoying forehead wrinkles disappear. I love when two good products work great together AND meet my needs. 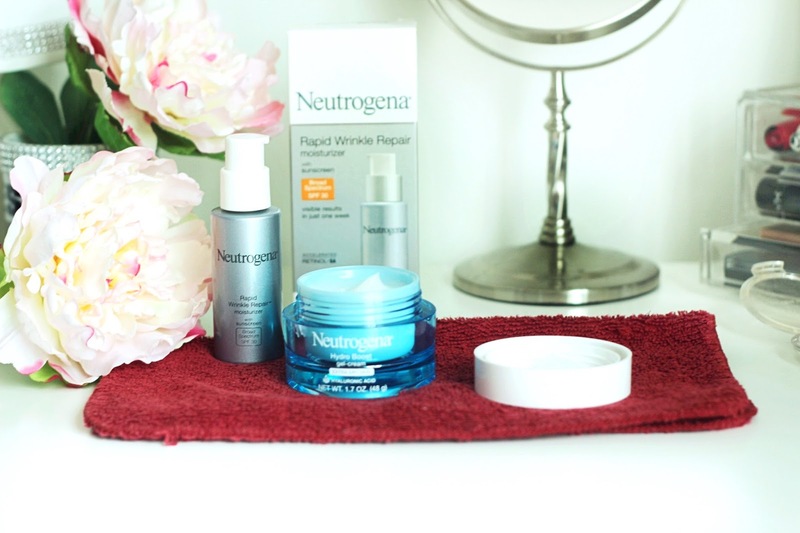 I'm one happy camper with healthier-looking beautiful skin thanks to Neutrogena. P.S- these products smell amazing! Hope you enjoyed today's beauty post. When you take skincare as seriously as we do, you're always on the hunt for the game-changing skincare products. You know the ones—those holy grail products that cut down prep time, restore your skin to its glowy angel potential, and keep it hydrated all year long. Very informative post.